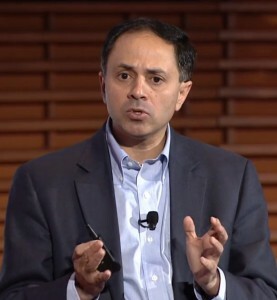 Earlier this week I serendipitously stumbled upon a TED Talk entitled “Molecular spies for early disease detection” delivered in August 2012 by Dr Sam Gambhir, Chairman of Radiology at Stanford University and Director of the Canary Center for Cancer Early Detection. In a presentation lasting less than 20 minutes he provides a compelling argument for how we will screen for breast cancer in the not-too-distant future. On a graph plotting ten-year survival versus stage of cancer detection, Gambhir shows how a woman diagnosed in stage I has a far greater chance of survival than another patient diagnosed at stage III or IV. He describes the challenge as detecting cancer when there are just a few thousand “rogue cells” rather than at a later stage when the breast lesion is palpable and there are a few billion cancer cells, some of which may already have metastasized to other parts of the body. Gambhir’s approach to diagnosis and treatment is based on three steps: first, using blood-based in vitro diagnostics, proteins specific for aggressive tumours are identified; and second, using “molecular spies” that can be programmed to attach themselves to cancer cells and then send out signals, the 3D location of the tumour can be established using in vivo molecular imaging techniques. Finally, using an intervention such as high-intensity focused ultrasound, the cancer cells can be destroyed. Hence the title of this blog: identify, image, intervene. If you believe that, you will believe anything. Early cancer cells are just like the normal ones, and escape even the body’s immune surveillance systems, and other deletion mechanisms. That they can be selectively destroyed by ultrasound is stretching the imagination. the picture is a joke. I have to disagree with you on this one, David. I have read some of the work by Gambhir and his co-workers and I am of the opinion that they are on the right track. While blood-based biomarkers do not yet have sensitivity and specificity values approaching 100%, the evidence suggests they’re getting there. Regarding HIFU and its therapeutic potential, this too is an area that has progressed significantly in the past ten years. I am therefore optimistic that such tools will play a meaningful role in diagnosing and treating breast cancer patients in the years ahead.